Poll: US based Palm owners, who is your wireless carrier? Today’s announcement of the Palm Pre 2 coming to Verizon is great news for those who prefer big red. Of course, it was only a few months ago that we saw Verizon release the Palm Pre Plus, which offered improvements over of the original Palm Pre. No doubt Verizon is the largest US wireless carrier, but how does that translate to the current install base of Palm fanatics, most of whom are desperate for an update from the original Palm Pre that dates back to June of 2009. Time to break out the polls and ask our US based readers, “Who is your current wireless provider?” Are you considering a jump to Verizon for the Palm Pre 2 or holding out hope for an updated model from either Sprint or AT&T. Let us know in the comments. Owners of the AT&T Palm Pixi Plus should be excited today as Palm has released the webOS 1.4.5 update that should be hitting your phone OTA. The big news here is that you’ll now be able to enjoy PDK developed games, so we don’t mind if go get your Angry Birds on. This release includes minor fixes and enhancements to support the public release of the webOS PDK. If a user enters text in a field on certain websites, the screen focus now remains on the text being entered. This release fixes a rare problem so that podcasts now download correctly. This release addresses several security issues with the Palm webOS software. We’d like to thank Nils of MWR InfoSecurity and Chris Clark for their help in identifying the issues addressed in this release. Individuals interested in contacting Palm to report suspected security issues can find more information at palm.com/security. If you are looking to save a few bucks off the price of an AT&T Palm Pre Plus, you can now order a refurbished Pre Plus for just $49. This price does require a new 2-year commitment, so it’s not a significant savings over the new model which is priced at just $99. The no-committment price is still set at $299, which is still less than Palm’s developer pricing where it’s a whopping $479.99. HP has a new promo at their wireless store, offering any device on any carrier for free. In addition, you’ll receive a gift card valid for $50 in the App Catalog. Thankfully, we saw a unified release of webOS 1.4.5 for both Verizon and AT&T. The update will of course come OTA (over the air), so there’s a good chance it hit your phone last night. Here’s the changelog from Palm for the AT&T update. This release may require you to update certain apps to their latest version to properly support the launch of the webOS Plug-in Development Kit (PDK). If you have a game that is not saving your game information correctly (high scores, stages, settings), check the App Catalog for updates. For more information on updating apps, see Using App Catalog . Let’s hope that going forward carriers are a little quicker on the take. In any event, get to updating and let us know how webOS 1.4.5 works for you. Good news for those of you considering the Palm Pre Plus on AT&T. 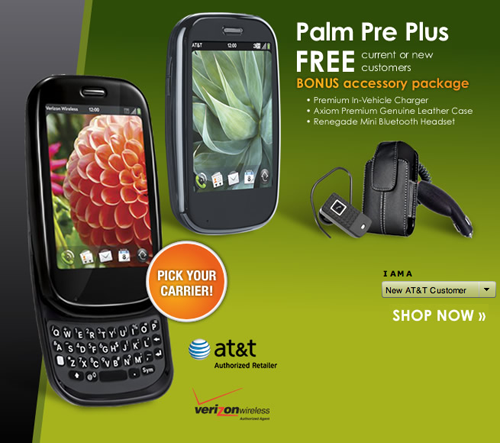 TFTS lets us know that AT&T is now offering the Palm Pre Plus for just $99 after a $50 instant discount. It’s currently out of stock, so it’s not clear why they would be dropping the price. For those of you looking for attractive no-committment pricing, you can score the Palm Pre Plus for just $299. For more information, check out AT&T Wireless online. You can find these promotions at HP. Surprising news today coming from a developer webinar hosted by AT&T and Palm. According to one of the slides, Palm will be running a 50% off promotion on all App Catalog apps. Of course this benefits end users, but it also benefits developers who will still see payments based upon the full retail price of their apps. Palm will be subsidizing the promo. For those counting at home, that’s $1 million for the Hot Apps promo ending June 30th, another $1 million for the PDK Hot Apps promo and now this limited time 50% promotion. Palm is certainly doing everything they can to stir up excitement among both developers and end users. The rumored dates for this promotion are June 21st through July 9th. If you’ve been sitting on the sideline waiting for a price drop on the AT&T Palm Pre (see our review), your patience has been rewarded with a new deal available at Amazon. The Palm Pre Plus is available for a penny. This does require you either sign up for a new contract. If you are upgrading, the price jumps to a wallet-friendly $49.99. The Palm Pre Plus comes with free shipping and no activation fee. Unlike the iPhone 4, Amazon has plenty in stock, but we bet they’ll sell faster at this new rock bottom price.